Co-founders, Jason Russell (from left), Bobby Bailey and Laren Poole, record footage in Africa in 2007. Photo Courtesy of PRWeb. probably still is, the viral sensation of our generation. In a post from way back when, I had written about the campaign’s fierce influence on young adults all over the world and how it had managed to engage active participation amongst a modern crowd that’s typically far too inactive when it comes to taking social action. My “inner child” had been been gladly revived and I had been quick and eager to believe that maybe, just maybe, Invisible Children’s (the famed group behind the Kony 2012 film) hard work might slowly pay off after all. A massive miracle of the hip new digital age– that’s what it would have, could have, and probably should have been. But like most overnight sensations, the San Diego-based non-profit and its over 100 million-viewed/1.3 million-liked YouTube hit had its fifteen minutes of glory and fame. Then it crashed the internet and eventually got lost in a sea of other do-good media initiatives hoping to make some kind of difference in this messed up world we live in. So wasn’t it just a nice surprise to find out earlier last week that IC would indeed become i-n-v-i-s-i-b-l-e within the next year or so. Slowly but surely they’ll be shutting down all operations– first in the U.S. where only “a handful of remote workers” would stay behind to work on advocacy. In further months, all ground work in East Africa will be handed off to partner organizations. It really is a shame and I really hate being the Betty Buzzkill that mutters ‘I told you so,’ but it’s time to face the cold hard fact that most– if not all– of us only ever got involved because, well, everyone else was doing it. We were all skeptical from the start, at least I was, about how much of a difference the project would actually make in bringing Joseph Kony and his LRA to justice; in building an international support system that would end Ugandan conflicts once and for all. And I’m pretty sure co-founder Jason Russell’s immensely publicized mental meltdown didn’t help the situation one bit. 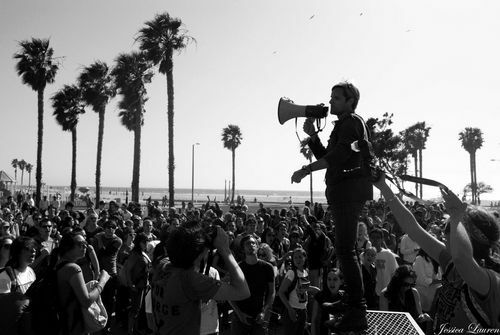 Invisible Children,”The Rescue”, Santa Monica. Photo Courtesy of Flickr. However, just to put all criticism, cynicism, and skepticism aside, the fact remains that Invisible Children succeeded in raising a lot of awareness about Kony; in building support for intervention by U.S. forces in Uganda; in galvanizing action to apprehend the warlord. In doing so, the campaign demonstrates that social media activism isn’t necessarily as superficial and ineffective as so many people still think it is. So, it should be said that the project (though hardly a defining success) seems to have taken activism onto a whole new plateau. It’s gotten a giant group of internet-savvy millennials who would otherwise do absolutely nothing to actually do something. That’s a feat in itself, an accomplishment that should bring us all at least a thimble-sized amount of extra holiday cheer. Nicely said Mr. Keesey. Let’s continue giving, receiving, and creating those chances. There’s always hope for the hopeless.